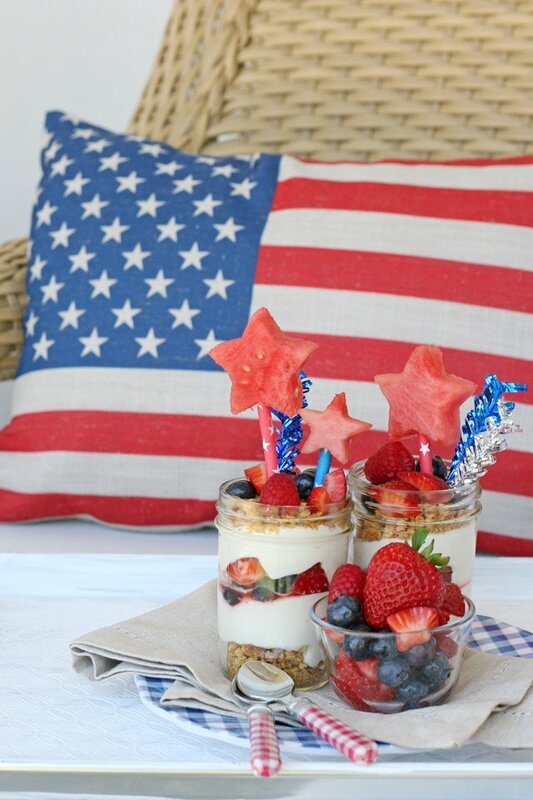 This festive 4th of July Berry Cheesecake Trifle is a recipe you’ll enjoy all summer long! 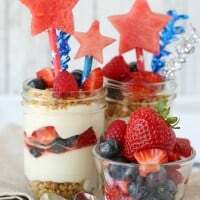 This pretty treat starts with a creamy, no-bake cheesecake, then gets topped with fresh summer berries and a graham cracker crumble… top with watermelon stars for an extra festive touch! 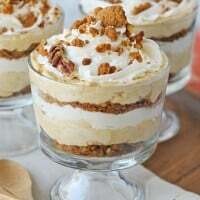 Feel free to prepare this dessert in a large trifle dish for a crowd, or serve in small jars as shown… either way, it’s a fresh and delicious dessert everyone will love! 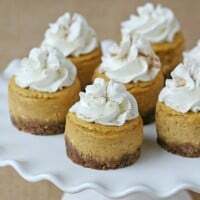 I created this festive treat in partnership with Sprouts Farmers Market. 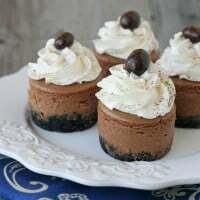 I know I can depend on Sprouts for fresh and beautiful fruit (and veggies) and then I can stock up on all of my baking stables like sugar, vanilla and graham crackers, so I have everything I need on hand to make a quick and beautiful treat! You’ll find everything you need for this recipe from Sprouts… and if you’re like me, you’ll find that lots more delicious things just seem find their way into your cart too! 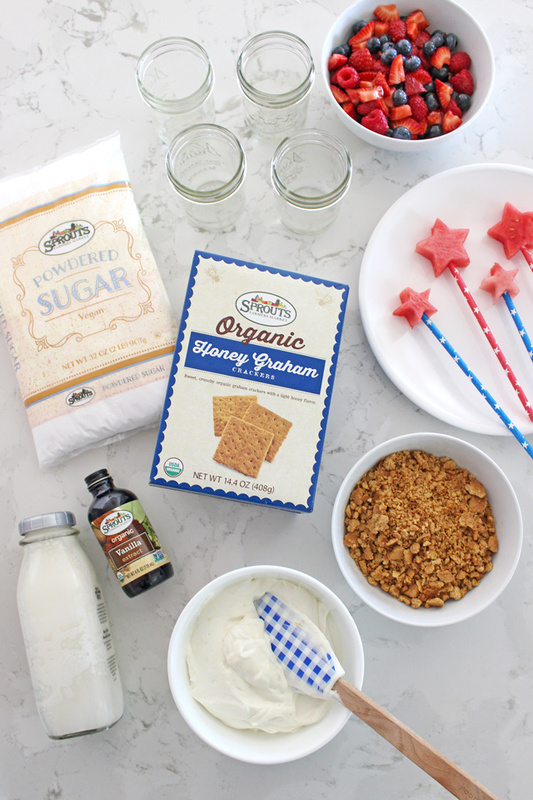 In fact, one of my family’s favorite Sprouts brand treats are their Old Fashioned Vanilla Wafers… which would work perfectly well in this recipe as well (just swap out the graham crackers). This 4th of July Berry Cheesecake Trifle is actually a refresh of a recipe I shared 5 years ago, this Strawberry Blueberry Mini Cheesecake Trifle. It’s such a delicious concept, I thought it really deserved a pretty make-over and a little recipe update. 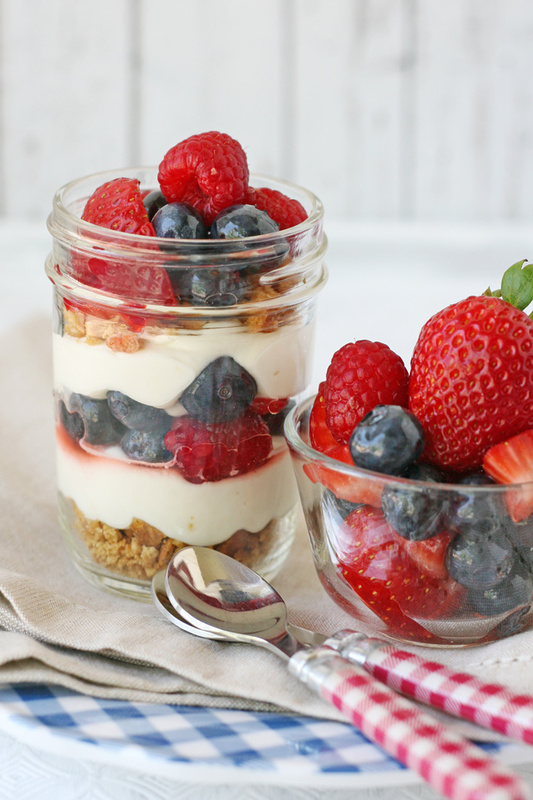 Creamy, no-bake cheesecake is layered with fresh berries and a graham cracker crumble to create a delicious and colorful treat, perfect for the 4th of July! Combine fruit in a bowl with 1 tbsp. of honey or sugar, then stir well and set in the fridge until ready to use. Add crackers to a plastic zipper type bag and crush (with a rolling pin). In a medium sized bowl, melt butter, and then add crushed graham crackers and sugar. Stir well, then spread onto a baking sheet and bake for 5-7 minutes. Allow to cool while preparing the cheesecake filling. In the bowl of an electric mixer, blend cream cheese until smooth. 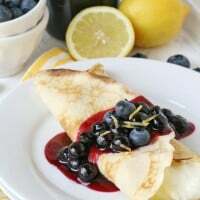 Add powdered sugar, vanilla and lemon zest and blend well. While slowly mixing, add (cold) heavy cream slowly, then whip until smooth and increased in volume by almost double. Begin assembly by adding 1-2 tbsp. (cooled) crumble to the bottom of 4 (1/2 pint sized) jars. Add a layer of cheesecake, then a layer of fruit. Repeat layers, as desired, depending on the jars or dishes you’re using. If desired, add watermelon star garnish by using a star shaped cookie cutter to cut starts out of a large slice of watermelon. Add watermelon stars to paper straws and garnish your trifles. Refrigerate trifles for 15 minutes before serving, or up to 6 hours. To make one large trifle - Double the crumble portion, and triple the fruit and cheesecake portions. If you need to make this a truly no-bake dessert, feel free to omit the step of baking the crumble. The crumble will still be perfectly delicious, just not quite as crispy. Looking for more 4th of July inspiration? 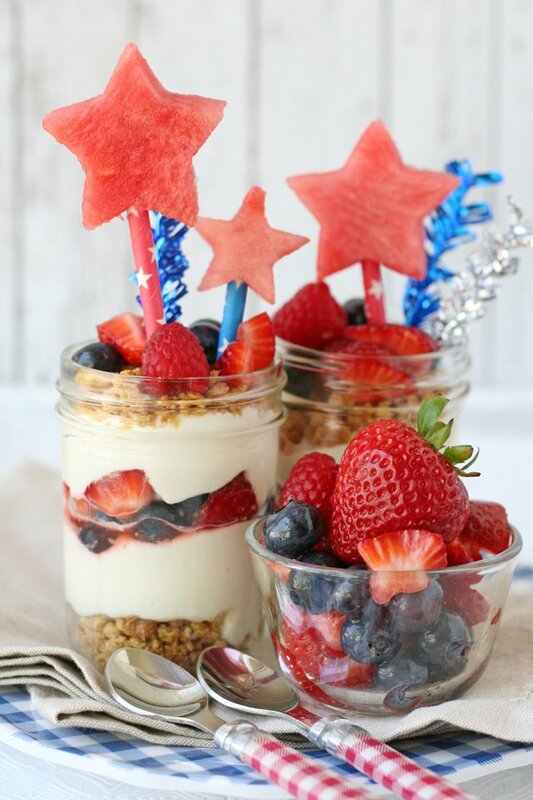 You’ll find lots of cute 4th of July treats HERE. This looks absolutely perfect for these hot summer days and so festive for the upcoming 4th holiday! can it be stirred without using mixer ? ?